This is our third opportunity to work with Renee Newman and we were thrilled to contribute our jewelry and gem photos to her newest gemology book. We’ve also contributed to Exotic Gemstones Vol 1, Vol 2 and will be contributing to Vol 3 due out sometime this upcoming year. Volume 3 will include fire agate~ one of our specialties and most beloved gemstones to work with in our lapidary and jewelry studios. In this book Mark contributed his knowledge on the gemstones we submitted as well as jewelry made by both Mark and myself. Below are some of the pieces we contributed and brief descriptions of these beautiful, rare gems. 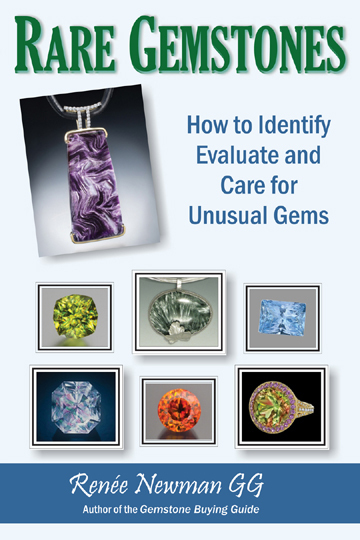 Thanks to Renee Newman for including us in another of her informative and wonderfully composed gemology books! 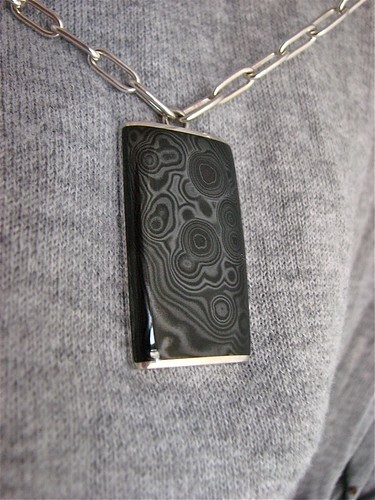 psilomelane is a black opaque rock with unusual patterns, sometimes containing tiny black sparkling crystals called druse. 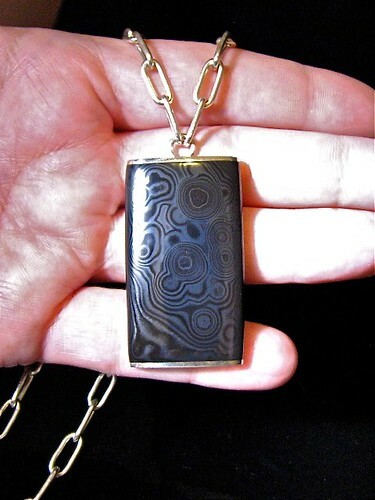 Most of the jewelry-worthy psilomelane is mixed with crypocrystalline quartz, such as the material from the Silver Crown Mine in Chihuhua, Mexico; This material is as hard as 6-7 on the Mohs scale and takes a beautiful polish as well as being quite durable. 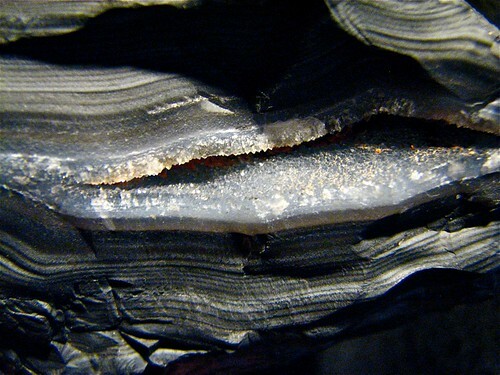 One of Mark’s submitted photos showing psilomelane with druse. 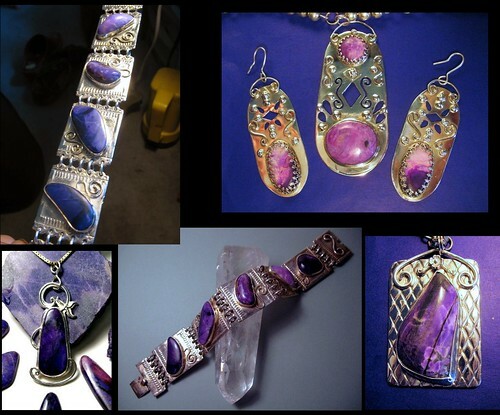 A set of Jewelry made by Jessica Dow in her first year making jewelry…. 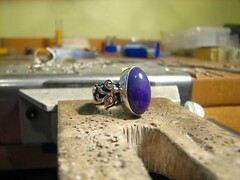 hand fabricated and all gemstones cut by Jessica Dow also. 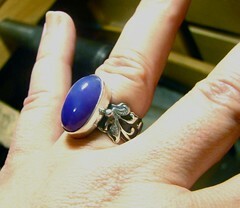 Gel Sugilite Ring with Pierced and Hand Engraved Scrollwork Designed and Hand-Crafted by Jessica Dow. Hand Engraving by Mark Anderson… made late 2011. Antiqued base for added contrast. 100% hand fabricated. 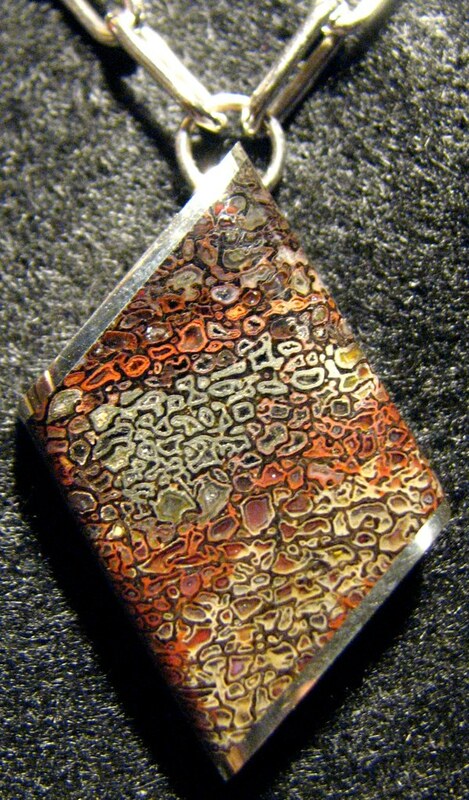 Beautiful Gem Dinosaur Bone Pendant by Mark Anderson with a large section of bone containing pyrite. A gorgeous example of another rare material. Discovered in 1960 in Tugtup Greenland…. 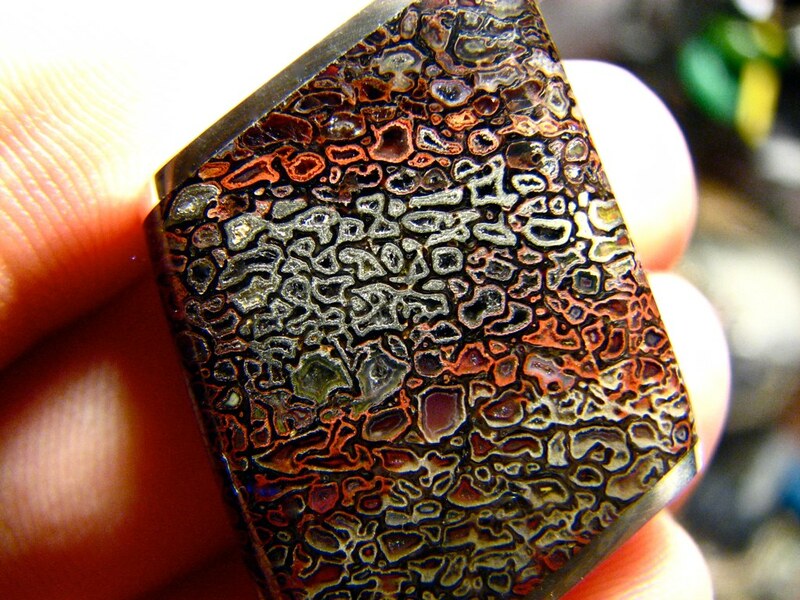 a very unusual and beautiful material rarely seen in jewelry. Tugtupite set in 18ky. This is the pendant after sitting under a UV light. This material becomes a darker pink to red after being exposed to UV light. The color fades after a while until it’s exposed again. Tugtupite in 18ky and a piece of the rough it came from. You can see they’re both a different shade of pink. 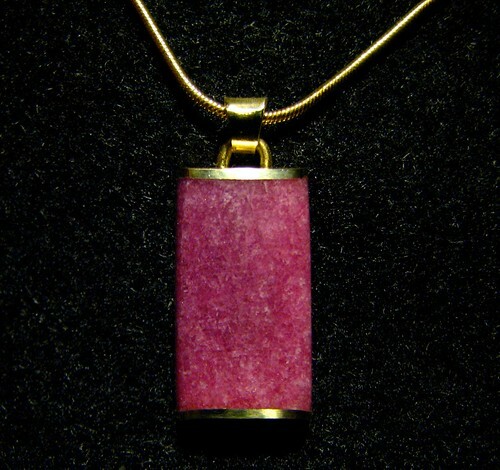 The pendant has been exposed to UV light, making it a gorgeous dark pink color after charging under this light. 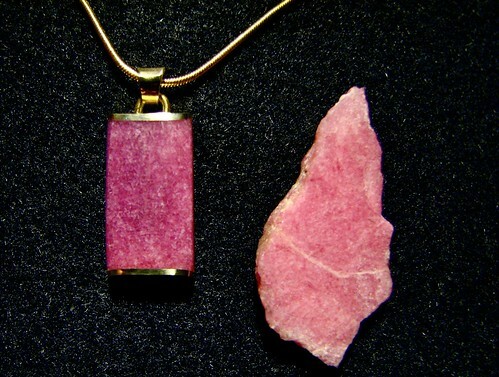 The rough next to it is the same material used in the pendant but it has not yet been charged. The rough will turn the same color as the pendant if exposed. 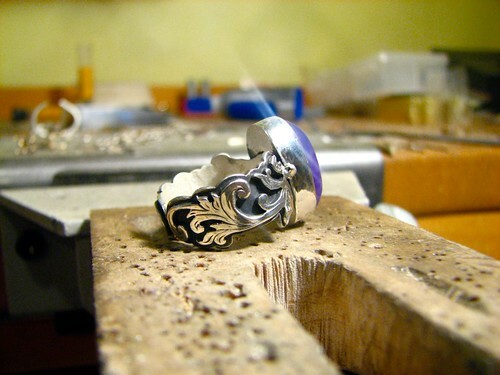 What a brilliant craftsman nature is – great to see human craftspeople paying exquisite tribute. Lovely, lovely stuff.